I purchased this Americana primitive style flag sign about 6 years ago at a local craft shop. It had been placed on clearance for $8. 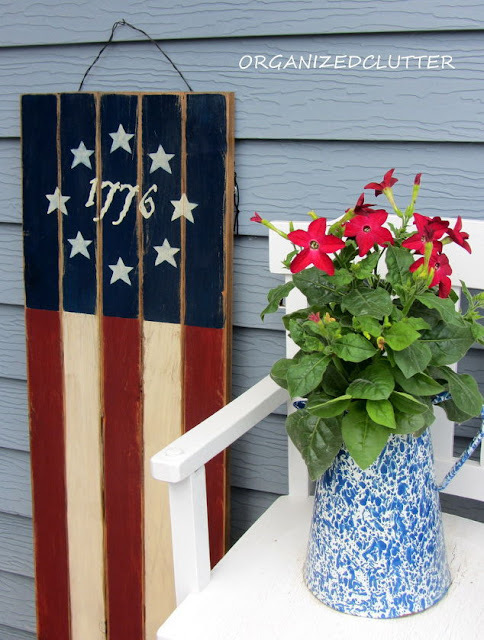 I incorporated it for several years in my outdoor 4th of July decorating and I also used it indoors for Americana/patriotic vignettes. I haven't used the sign for a couple of years now and I had considered selling it, when inspiration struck to "makeover" the sign. The back was stained and rather rustic looking, and I decided to use the back for my new design. If you can't find a pre-made sign like I did, you can cut five 2 1/2" x 44" x 1" boards and attach them with two cross boards nailed into all five boards. 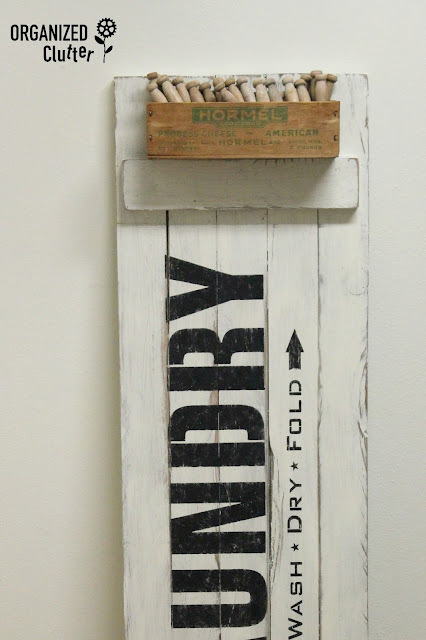 I painted the back of the sign with two very thin coats of Annie Sloan Chalk Paint in Old White. I sanded the piece with 220 grit sandpaper and a wood block. 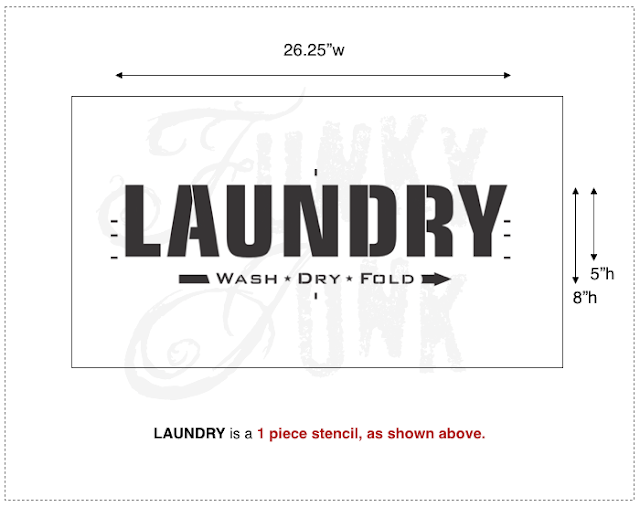 I recently received a complimentary stencil from Donna of Funky Junk Interiors blog to share with my readers. If you haven't checked out Donna's *Old Sign Stencils line, by all means click the link and see the whole line, along with Donna's clever signs and decor created with stencils. Besides the flag sign, I used a Hormel American Cheese crate purchased at the thrift shop for $2. 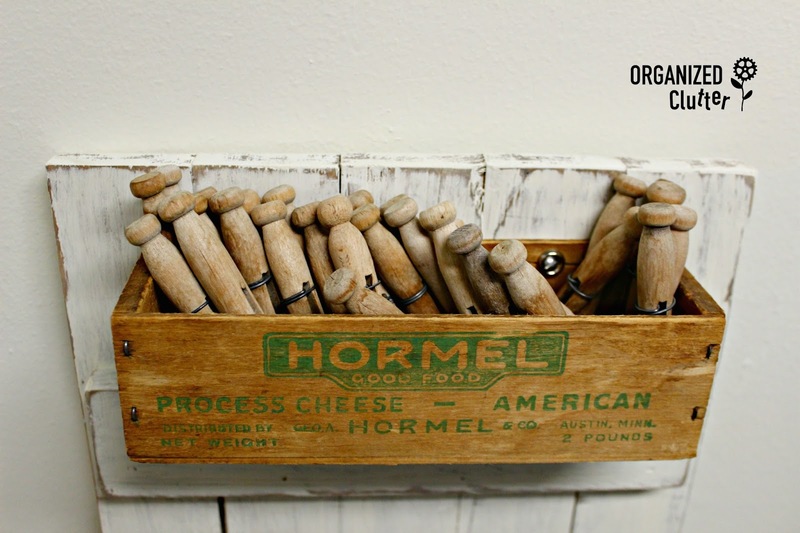 Also vintage clothespins from the thrift shop. The little Hormel cheese crate was attached to the top of the sign with screws and washers, and filled with the clothespins. 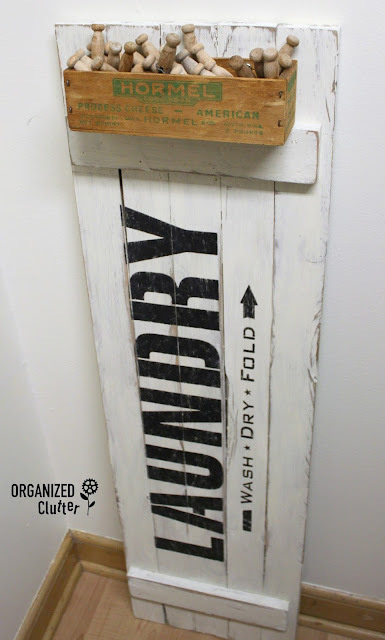 I also attached a saw tooth hanger to the back of my sign to hang it on the wall. I know I am going to keep my new sign for the laundry room but haven't decided exactly where to put it. 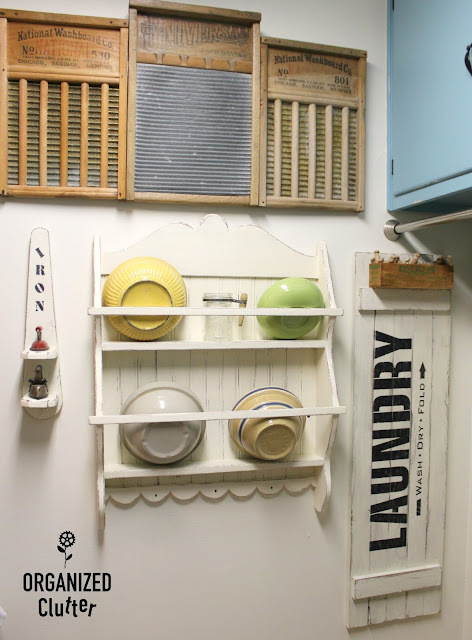 I also like it propped up against the wall because the clothespins and cheese box are easier to see than when its hanging on the wall or a door. A new life for an old sign! On Saturday, October 22nd, I hung the laundry sign on this wall in my laundry room. 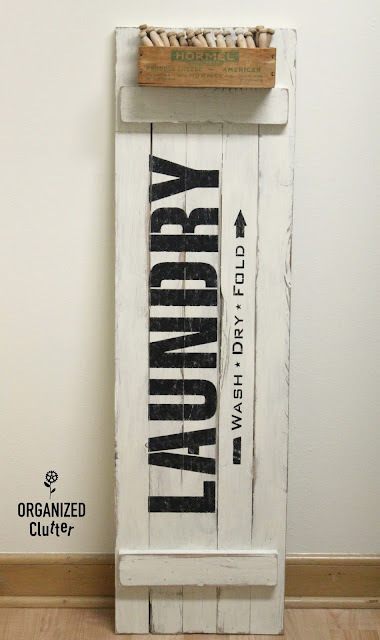 This looks great, Carlene...and I love that you re-used a sign you had! Looks great Carlene ... the old cheese box and the clothes pins are just perfect for it. Hi Carlene, I like the white wash with the stencil! It turned out perfect and you got to re-use something...love it! Love all you did with this!! Great makeover. I agree! so yay..This makes me happy. Thanks! I love this sign. Love the use of the cheese box as well. Very very cute! Love it! I clicked over because of your "bad crop" comment on Funky Junk. I figured I'd better make sure it got some attention and I'm glad I clicked over - great job on it!!! So in LOVE with this striking combination, Carlene! I could think of millions of ways to use this beauty! Wow what a transformation. It's wonderful. So many things you can transform with some paint.